On the afternoon of March 26, delegation of RWTH Aachen University (RWTH) headed by Prof. Bernd Markert, Vice Dean of Faculty of Mechanical Engineering and Institute Director of RWTH Institute of General Mechanics visited SSPU. 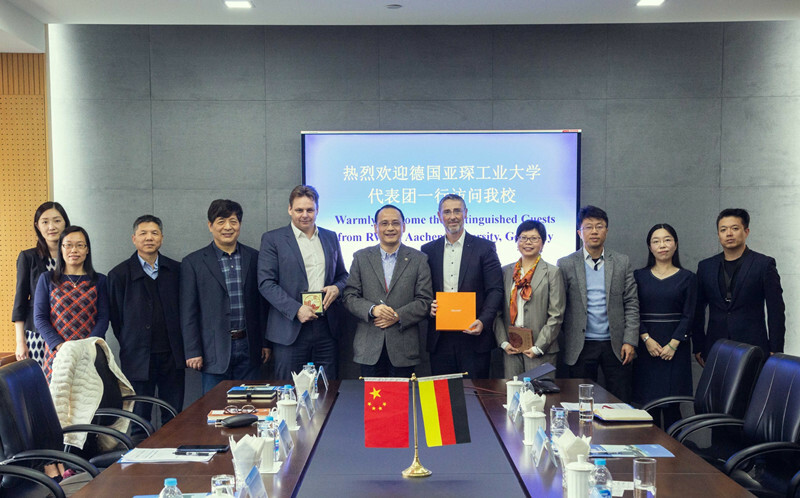 Dr. Helmut Dinger, Managing Director of RWTH International Academy, and Ms. Li Min, China Project Manager of RWTH, were in the delegation. President Yu Tao met with the guests. On the meeting, President Yu introduced SSPU’s basic information, current development and internationalization strategy, and stressed the significance to develop the all-round and substantial cooperation between the two universities in the field of Mechanical Engineering under the background of Made in China 2025 and Industry 4.0. He hoped that both sides could grasp the opportunity to push forward the cooperation like teacher mobility, student exchange, joint research, etc. in Mechanical Engineering with the good beginning of this visit. Prof. Markert said the two sides would further discuss and find out the cooperation fields of common interests and believed there is a broad collaborative prospect between the two sides. During the visit, the delegation visited SSPU Smart Manufacturing Factory Lab, had academic exchanges with the teachers of Mechanical Engineering, and met with the students of related programs. Representatives of International Office and College of Engineering attended the activities.